This article on the strato-plane of the future tells how huge double-decked planes will speed through the rarefied air from coast to coast in six hours. WHY fly in the stratosphere? Simply because there’s a free 200 mile an hour boost up there that aeronautical engineers want to take advantage of. If one could plan a railway that would run down hill all the way from coast to coast, think of the transcontinental speeds he could attain. Flying in the stratosphere is not as simple as building a downhill railway, but it is a subject which has intrigued airplane designers for a long time. Much data has been accumulated about it. Many rumors have seeped through the daily press about the wonderful trans-oceanic speeds we are going to get. All that is in the offing. Right this minute, however, enough material has been accumulated through pioneer experiments and flights to turn the minds of those of us who are engaged in the business of developing airplanes toward the possibility of building a stratosphere plane today. 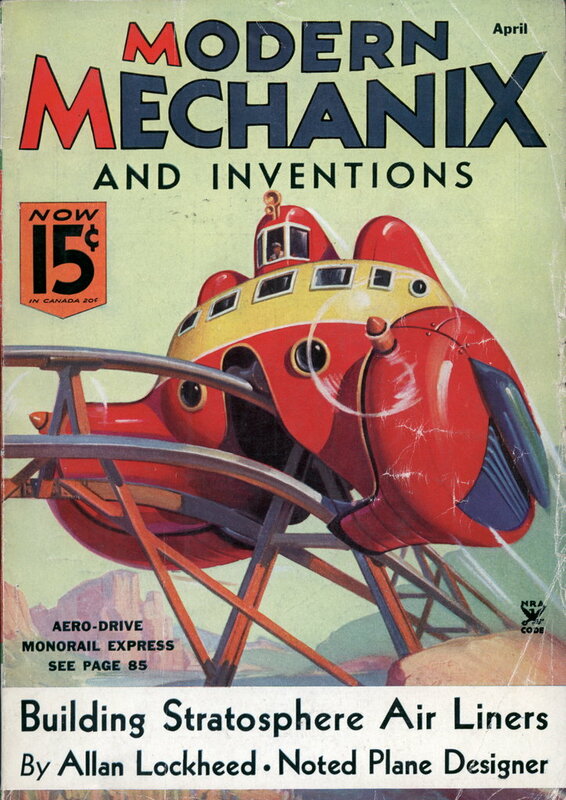 Under existing conditions, with existing materials, we plan to double our present speed by the simple expedient of welding this 200 mile an hour stratosphere boost to our cause. Up in the stratosphereâ€”that layer of air between 50,000 and 75,000 feet altitudeâ€”there are steady winds that blow from West to East, opposite the direction of the earth’s rotation. By these winds alone we can gain a measurea-ble increase in our overland speed. But there is another factor. As we ascend, the density of the air becomes less and less. This eventually diminishes to a point where we have gained the effect of reducing our fuselage and wing drag; which is the same as saying we have reduced our wing surface to the minimum. At the same time, through supercharging or forcing air into the carburetor to increase performance, we have maintained our motor power output. The result is naturally a big jump in speed. The only justification for stratosphere flight is velocity. If two points are so close together that an airplane could reach one point from another in less time than it would take to climb into the stratosphere, go the distance and descend, there will be no need for stratosphere lines. But the coast-to-coast route is a logical objective! Volume of traffic in paying quantities and the great time to be saved create a demand for such service. Since the eastern trip will take about 6 hours under top conditions, probably the airline men will loaf from Los Angeles to New York, taking 8 hours. Then by speeding the ship up against headwinds, they can maintain the same schedule going west to the coast. Here it will be a matter of psychology in balancing public feeling so that the traffic will be as heavy one way as the other. But I’m getting a bit ahead of myself. I talk just as though the stratosphere airliner were an accomplished fact. To me it is. I’ve carried all the probabilities around in my mind’s eye until I can recite them backwards. Cleopatra could have had an automobile, you know. At that time all the materials existed which were necessary for the construction of the car. We can have a stratosphere plane if we want it; and we know how to build it and what it will look like. I’ll tell you what the plane will look like, and why it will be constructed the way it will. Confidence in this prediction is based on the fact that my early ideas have stood the test of time. Some of the designs I did ten and twelve years ago, radical at the time, can now hold their own with ships of conventional 1934 design. Working closely with aviation problems, things I have seen at an early date have later come- to pass with considerable accuracy. would hold its own though stacked up against a modern ship on any tarmac. In 1926 I organized the Lockheed Aircraft Corporation. The fuselage construction used in the Scoutâ€”the plywood monocoqueâ€”was improved upon in detail but not in principle, and we commenced manufacture of the Lockheed Vega. This ship did big things. It was aerodynamically clean, a fact which can be attributed to the idea of building the plywood fuselage in a concrete mold. The resulting streamline fuselage has not been amenable to improvement. The fuselages of the ships that are cutting airmail times in half today are built on forms of a principle laid out 16 years ago! Right back into the stratosphere again! We can build a ship for it now. We’ll be flying it within a very few years; possibly months. 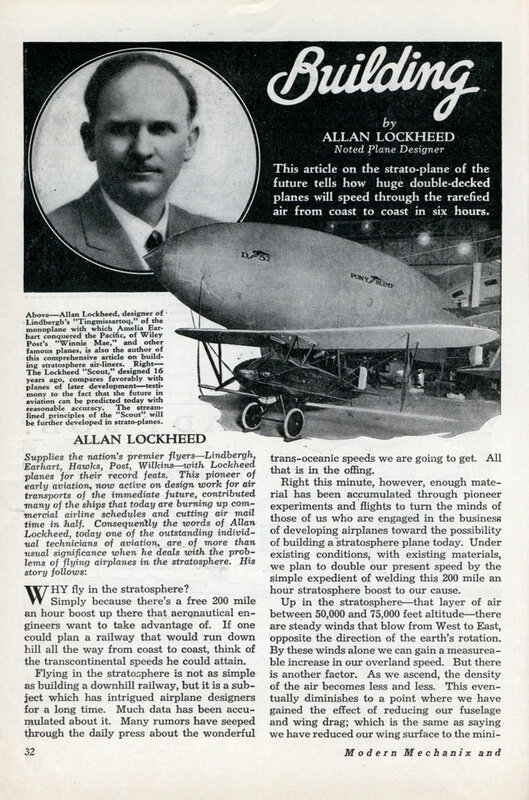 And the speeds, the comforts, the unusual travel factors introduced by actual 400 mile an hour speed will put the stratosphere transcontinental air-liner in a class where it will make today’s airmail planes look just as sad as today’s ships, today’s comforts and progress make the old DH-4 Liberty airmail planes look. The present twin-motored transports are 60 to 80 feet in span, and 40 to 50 feet long. For stratosphere flight a plane would have to be a real passenger carrier, and it would have seats above and below the mid wing. It would be double decked, so to speak. It would be more than 100 feet in span, and over 60 feet in length. Those are the major outward differences. Inside the ship is where most of the radical engineering departures will be seen. Why the changes? Take today’s airplane up to 50,000â€”75,000 feet (supposing you could get it there) and what would happen? A number of ridiculous things. For one thing, the engine would slow down and die. If you happened to supercharge it so it could breathe sufficient air to burn a normal amount of gas, it would run away with the propeller and would wind up at a fearful rate, probably breaking â€¢ a crankshaft and throwing connecting rods all over the country-side. It would be a problem to keep the motor warm. Oils, to be effective, must run at 350-450 degrees, and the cylinders themselves must be that warm to obtain thermal efficiency from the gasoline heat energy which is doing the work. The tires of an ordinary ship would probably blow out. The people in the cabin would suffer the bendsâ€”a nausea and bleeding due to insufficient oxygen and deficient air pressure. And the ship itself would load up with a ton of ice in no time. What is more, the ordinary airplane of today could travel only in one direction. A 200 mile an hour airplane could make it overland at 400 miles an hour from California to New York. Then when it had performed the phenomenal feat of going from Los Angeles to New York in 6 hours, it could make the return trip quicker by coming back to Los Angeles via London, Constantinople and the Hawaiian Islands! That is because a 200 mile an hour ship flying against a 200 mile an hour wind stays in the same spot. Temperatures are way down, about 50 degrees below zero F.â€”this means we’ve got to build a flying ice box to keep the passengers warm. And we must keep the engines warm â€”normal operating conditions must be artificially supplied. We’ll have to design something that will take the ice off wings as fast as it is formed. The sweating of windows, the forming of fog within the cabin, all will have to be accounted for by a separate de-icing, cabin warming, pressure furnishing plant that will run independently of the main motors. This pressure furnishing feature will probably have to function in the manner of the air conditioner. It will not do to use air bottles, because they are too heavy. The cabin space must be a chamber which has intakes and exhausts for conditioned air. The link between the cabin and the outer air will be a conditioning plant. Because of the low pressures, variable area as well as variable pitch propellers will have to be used. Such devices on the business end of an engine will be comparable to the gear shift on a car. Purely in the matter of borrowing from terrestrial aviation what appears to be good practice, I would use two motors in my stratosphere plane design. They would be supercharged, air cooled, and of the in-line type. This type is slightly cheaper to manufacture, is more robust, and easier to service. The major qualifying point which is now bringing such motors back into their own is that they streamline into a wing so well. By putting the wing at the middle of the fuselage, making it a mid-wing ship, streamlining the motors into the wing, and allowing a retractible landing gear which can be folded to the wings to lessen air resistance, we will arrive at the design of the ultimate airplane. Yes, that stratosphere ship will be uniqueâ€” a flying wing that will whisk people about so rapidly they’ll scarcely need to eat from coast to coast. We may have to educate a new breed of passenger, but the knowledge, materials and men to build and fly the stratosphere air-liner are hereâ€”right now! In the article he lists all the reasons it can’t be done and won’t be done for another 15-20 years, until jet aircraft are developed.